You and your bird can share a bonding experience with this cute acrylic ring toss. 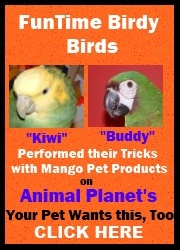 There are several ring shapes and colors for your bird to learn and have fun. Small beaks love to do tricks and learn just as much as their larger feathered friends do. Also, check out my Severe Macaw Buddy doing the Ring Toss using the African Grey/Amazon size Ring Toss on Animal Planet's "Your Pet Want's This, Too"
Bird trick training ring toss toy peg measures 2.25" x 2.25" x 2". Contains for 4 colored marbella shapes measuring approximately 1.25" x 1.25" and comes in the following colored shapes: 1 square, 2 circles, and 1 triangle. Ring Toss Bird Trick Training Toy for Conures/Cockatiels5Kelly jollyNovember 28, 2014My little Quaker is still getting used to this toy. She will never be on TV due to her skills with this. She just holds the rings in her beak and maybe drops them over the counter to the floor. I think she likes me fetching them when they roll all over the floor LOL. It is a super great toy for her to play with and who knows, she may even play ring toss and make them on the stick! Love the toy!! Ring Toss Bird Trick Training Toy for Conures/Cockatiels5CarolOctober 14, 2013I've been doing clicker training with my young sun conure for the past four months and this has been a great game for him. He figured out pretty quickly if he picked up a ring and put it in my hand he would receive a click/treat! Now I just have to teach him how to put the rings back on! Perfect size for him to work with. Ring Toss Bird Trick Training Toy for Conures/Cockatiels5FrankieOctober 12, 2012Even though it doesn't say so, this is a fun toy for budgies also. Sometimes the plastic rings are hard for me to work with, but mom has found other things to put on the holder that I can get a better grip on. I love pulling my mini birdie bagels off (sometimes even before mom has put them all back on!). Mom says some day I'll have to learn how to put them on, but it's so much more fun to pull a ring off and run across the room with it!!! Ring Toss Bird Trick Training Toy for Conures/Cockatiels5LynzieAugust 3, 2012My Caique loves to take the rings off and squeel with happiness. I love the toy and so does he! Ring Toss Bird Trick Training Toy for Conures/Cockatiels5Keri PJanuary 9, 2012Perfect size for my Quaker. He loves to take the rings off and carry them around. He also likes to take the rings off and toss them to the floor. It keeps him busy for a while.